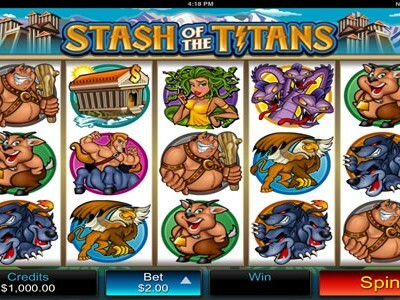 Stash of the Titans pokies game is a Microgaming 5-reel, 20 payline slot inspired by Greek mythology with heaps of winning opportunities and big payouts. This slot will take you on an epic adventure with Greek mythology symbols galore including Medusa, Pegasus, Cerberus and Kraken. Enjoy the free demo game above to see the game in action and try it out. Stash of the Titans has a progressive jackpot of 50,000 coins and the Wild symbol is the game logo which substitutes for all other symbols except scatter. For every Wild symbol on the payline your payout is doubled, so you can spin up some major big wins with the Wild. Usually Medusa is to be feared, but not in this vegas pokie. She will not turn you to stone, however she is key to winning the free spins as she acts as the scatter symbol. Three or more Medusa symbols scattered anywhere on the reels will trigger 15 free spins with all wins 3x. Big paying symbols are the Pegasus and Treasure Chest symbols, see 5 of these light up your pokies reels and you will win a BIG payout. This slot is available in all Microgaming casino lobbies either via download or no download required flash.